Insect screens, flyscreens, pet screens for all occasions in domestic, leisure, commercial and industrial applications. 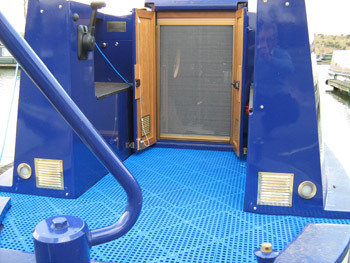 At CABINCARE we can supply various types of screens to keep pests out and pets in! All our screens are made to measure and are easily fitted. We can carry out a survey to advise how to go about insect prevention or we can send you our ‘How to measure for a flyscreen’ information sheets. In all cases the systems are easily fitted but we also provide a site fitting service if requested. Letting fresh air in and keeping pests out has been a problem since time began. 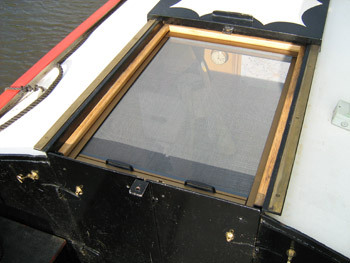 On canal boats we have developed a retractable flyscreen system based on a spring loaded cassette. The unique cassette roller insect screen provides year round protection against the discomfort caused by flies, wasps and other fling pests. They’re available in brown, bronze or white powder coated finish and are easily fitted. The assembly fits either within or around the frame of the hatch, front door or roof hatch. To operate the mesh is pulled down under tension from the cassette and locks into place via concealed catches inside the vertical guide rails and when not in use the screen simply retracts back into the cassette. For winter cruising a clear polycarbonate insert is also available which flex fits into the existing vertical rails giving more light into the cabin without letting the heat out! Hopper windows and ports are also catered for: for hoppers we provide a an aluminium frame into which mesh is fitted, this frame replaces the glass during summer nights giving added comfort to the crew with fresh air and no bugs. For ports and removable windows we supply a plastic ‘sandwich’ with mesh as the filling that again can be used in place of the existing window.